6/30 Cup of Coffee: A rough start from Jalen Beeks and the end of Ty Buttrey's scoreless streak led to Pawtucket's third straight loss, while Bobby Dalbec went deep for the 15th time for Salem. Denyi Reyes (pictured) continued his incredible run for Greenville, third-round pick Durbin Feltman debuted in Lowell, and Danny Diaz hit another home run in the DSL. It was the shortest outing of the season for Jalen Beeks as he allowed five runs on six hits over only 2 1/3 innings. All five runs scored with two outs in the second inning. Ty Buttrey's scoreless streak came to an end at 18 1/3 innings after he tossed two scoreless frames and then allowed a leadoff double in the fifth. He left with the runner on second and then Williams Jerez served up a home run as the inherited runner came around to score. Ryan Brasier has a scoreless streak of his own still going, and he extended his to 18 2/3 innings with a scoreless eighth. 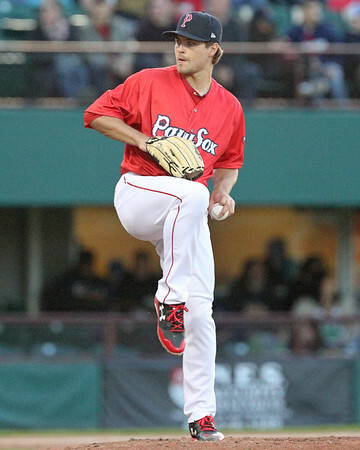 Jalen Beeks (pictured) was selected to the Triple-A All-Star Game on Wednesday. He is currently the International League leader with 101 strikeouts, which he has done in 75 innings. Ryan Brasier and Rusney Castillo will also be playing in the game on July 11 in Columbus, Ohio. Castillo will be making his second consecutive appearance, while Brasier is second in the International League with 11 saves. 6/29 Cup of Coffee: For the first time since Monday, the affiliates managed to notch a win. A Marino Campana (pictured) three-run homer in the opener of Greenville's doubleheader ultimately went for naught, but his solo shot in the nightcap helped key the split for the Drive. The hug watch season got underway early, as Santiago Espinal was removed from the Salem contest in advance of a post-game trade with the Blue Jays for veteran bat and former Red Sox draftee Steve Pearce. His teammates fell to Carolina and sit precariously close to being swept in their four-game series. Buffalo completed its sweep at Coca-Cola Field, outscoring the PawSox 14-3 in the three-game set. Chandler Shepherd allowed six runs (three earned) in 4 2/3 innings, surrendering a two-run homer in the third inning. Ivan De Jesus collected two of Pawtucket's four hits, driving in Deiner Lopez for the only run. 6/28 Cup of Coffee: It was another day of tough losses for the affiliates as they went 0-5 on the day while Greenville was trailing before its game was suspended. Adam Lind hit another home run in Pawtucket, while Tyler Thornburg made another rehab appearance for the Sea Dogs. Tanner Houck was able to miss bats and limit the walks as he switched up his arsenal, and Ty Buttrey (pictured) extended his scoreless streak to 16 1/3 innings. The PawSox managed only five hits, with a solo home run from Adam Lind plating their only run. Lind has now homered in three of his last four games, and he has hit safely in 10 of his last 11 starts. After snapping his five-game hitting streak yesterday, Sam Travis went 0 for 4 with a strikeout again as his average dipped to .215. William Cuevas was stellar on the mound, allowing three runs, two earned, over 6 1/3 innings. Ty Buttrey struck out two in a scoreless inning, and he now has 13 straight appearances without allowing a run. 6/27 Cup of Bitter Coffee: It wasn't so much that everything that could go wrong did, but more that nothing went particularly right. Boston's affiliates won none of their nine games, despite being competitive in nearly all of them: four of the losses were by one run, another three by two scores. 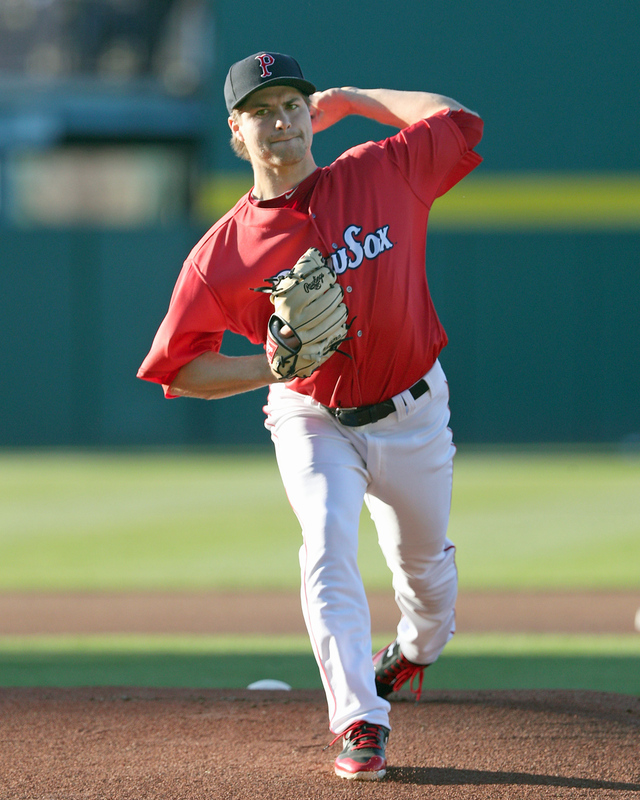 Some individual performance merited mentioning, such as Fernando Rodriguez stepping in admirable as the Pawtucket starter when Justin Haley was recalled to the major league club, and Travis Lakins (pictured) continuing to give no quarter since his conversion to the Portland bullpen. Projected starter Justin Haley was called up to Boston hours before game time, leaving manager Kevin Boles to piece together a bullpen game. Fernando Rodriguez got the starting nod, going the first three innings an allowing a run on five hits. Williams Jerez allowed a two-run homer to top Blue Jays prospect Anthony Alford that proved to be the difference in the game. Robby Scott and Kyle Martin combined for three innings of scoreless relief. Deiner Lopez supplied the PawSox scoring with a solo homer in the fifth inning. It was a tough evening in Manchester as the Fisher Cats jumped out to a 6-0 lead in the second and didn't look back. Kyle Hart was hit hard, surrendering three homers on his way to allowing nine runs (six earned) in 4 1/3 innings. The bright spot on the mound was Travis Lakins, who continues to be unhittable in a bullpen role. His perfect eighth inning included a strikeout as he registered his sixth consecutive appearance without allowing a hit. At the plate, Josh Ockimey drew another three walks, giving him seven over the past three contests. Luke Tendler doubled and drove in a run as part of a 2-for-4 night. Salem has been rotating three regular middle infielders, and all three continue to be the most productive members of the squad. CJ Chatham got the turn at shortstop and was 3 for 5 with a double, RBI, and stolen base. Second baseman Brett Netzer picked up a pair of hits and is 11 for 34 on his eight game hitting streak. Santiago Espinal, a shortstop by trade who got the start as the designated hitter, wasted no time extending his hit streak to 14 with a single to lead off the bottom of the first. He added a walk and stolen base. Starter Jake Thompson allowed five runs (four earned) on seven hits in five innings. Hildemaro Requena had a decent start come undone by a pair of homers. A solo blast in the fifth followed by a two-run shot in the sixth constituted the three runs the right-hander allowed in a six-inning stint that included three strikeouts and no walks. Lorenzo Cedrola and Everlouis Lozada had two hits apiece, while Ryan Fitzgerald delivered a two-run homer. The Cyclones stormed back with a pair of runs in the bottom of the ninth to hand the Spinners a come-from-behind defeat. Things got off to an auspicious start when Xavier LeGrant blasted his first professional home run, a two-run shot in the first inning. Tyler Dearden and Andre Colon added two hits apiece, with both scoring a run. Brian Brown got his second start, allowing two runs (one earned) in four innings, striking out three and walking two. Tanner Raiburn and Rio Gomez combined for four scoreless frames before Brooklyn reached Victor Diaz for two in the ninth. First, the good news: nobody got hurt, which made it a huge improvement over Monday. The offense totaled only three hits, with a double off the bat of Brandon Howlett the only knock that went for extra bases. Starter Edilson Batista took the loss, giving up four runs in 2 2/3. 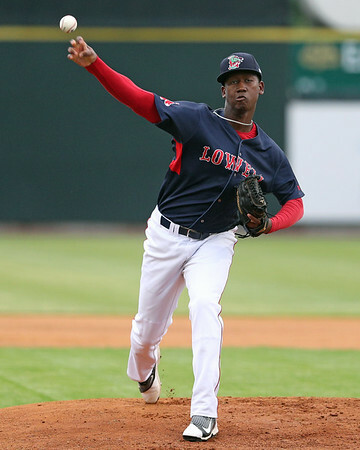 Boston's 18th-round pick Eddie Jimenez made his professional debut, allowing one hit in a scoreless inning. The Red Sox1 squad got swept in their doubleheader as the collected had just six hits apiece in the two games. After loading the bases in the first inning, they had only one batter reach as far as second base over the next six. Jesus Rosillo was the tough-luck loser in the opener, allowing two runs (one earned) on three hits in five innings. He struck out three and walked one. Left-hander Alvaro Leal, recently signed out of Venezuela, pitched a scoreless seventh in his pro debut. Like the first game, the Sox compiled only three hits. Unlike the opener, the nightcap saw them work 10 walks against Athletics pitching, on their way to four runs. Carlos Sanchez reached base three times, going 1 for 2 with a pair of free passes. Fabian Andrade was the only player to collect a hit in both games. Jeison Pena got the start, going five innings and giving up two runs (one earned) on two hits, striking out and walking two apiece. This game remained knotted at zero all the way until the bottom of the ninth, when two singles sandwiched a wild pitch and passed ball that plated the winner. Four pitchers combined on an effort that did not allow a single earned run. Jose Ramirez went the first 2 1/3, while Robinson Parra bounced back from a tough pro debut last Friday to strike out three in two innings. A double by Angel Maita was the only extra base hit on the day. Player of the Day: Short relievers don't usually get their due in this space, but Travis Lakins and his recent dominance demands attention. On May 31, Lakins was moved from a multi-inning role to a traditional one-inning usage pattern. Tuesday marked his ninth appearance since then, each one going exactly one inning. He has allowed just one hit in that time, while striking out 13 and walking five, holding opposing batters to an average of .034. 6/26 Cup of Coffee: A grand slam from Tate Matheny (pictured, left) propelled a comeback win for Portland and served as a theme for the farm on Monday: offensive production. 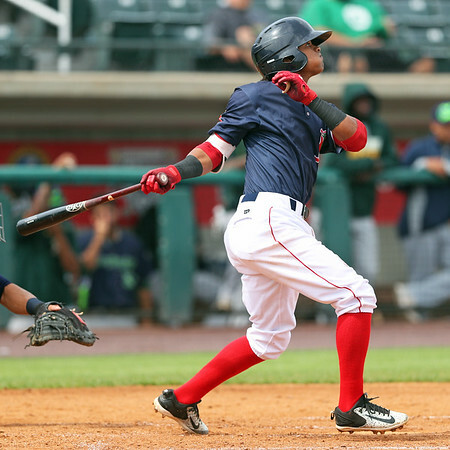 In seven games, six of them wins, the Red Sox farm system produced a total of 66 hits. Pawtucket, Portland and both DSL teams rallied for victories, with Adam Lind's two-run blast in the top of the eighth for the PawSox being the most dramatic come-from-behind performance. The only bad news on the day was 2018 first-round draft pick Triston Casas left his second GCL game with an apparent thumb injury. Adam Lind blasted a two-run home run in the top of the eighth and scored the winning run in the PawSox come-from-behind win over the Bisons. It was the 34-year-old left-handed hitting journeyman's fourth round-tripper with Pawtucket as Lind drove in all three of the PawSox' runs. Lind plated Ivan De Jesus Jr. with a sacrifice fly in the first inning, as De Jesus also scored on Lind's homer in the eighth. Rusney Castillo extended his hitting streak to nine games with his 92nd hit of the season. The SoxProspects.com 2018 Donation Drive is going strong, and we are about half way to our goal of $8,000 with about six weeks to go. Thank you to those who have already donated, and if you have not, please consider reading Editor-in-Chief Mike Andrews' blog post linked above. With many of the draft signings being wrapped up early, it means that the 2018 draft picks are starting to see the field for the first time as professionals. There were a handful of big debuts this past week led by first-rounder Triston Casas, 11th-rounder Nick Northcut, and 21st-rounder Brandon Howlett. Casas was at Fenway Park over the weekend, and he talked with WEEI’s Rob Bradford about why he thinks his swing is perfectly suited for Fenway. 6/25 Cup of Coffee: While Chris Sale was dominating at Fenway, the minor league affiliates were showing off some outstanding arms as well. Jalen Beeks (pictured, left) turned in another excellent outing, while Bryan Mata and Alexander Montero also delivered strong starts for Salem and Lowell. Coming off his weakest Triple-A start of the year, Jalen Beeks was back to himself on Sunday with seven shutout innings. Beeks faced only three batters over the minimum, allowing just three hits, striking out seven and walking two. Tyler Thornburg allowed a solo homer in his inning of rehab work, and Bobby Poyner tossed a scoreless ninth to close things out. Adam Lind and Oscar Hernandez supported Beeks with a homer apiece, with Hernandez adding a double. Sam Travis had three hits, while Rusney Castillo extended his hitting streak to eight games with his 90th knock of the season. 6/24 Cup of Coffee: Tempers flaring, extra-inning affairs, and walk-off wins and loses, sounds like summer. The PawSox got heated with the Chiefs in a loss while the Sea Dogs gave up a grand slam in the top of the 10th. Jordan Procyshen handed Salem a walk-off victory while Manuel Ramirez (not the one you're thinking of) took the loss for the DSL Red Sox1. Tempers flared in this one, as one bat flip from Syracuse cleared the benches, but the PawSox saw their four-game win streak come to a close. Chandler Shepherd failed to get out of the third inning, allowing six hits, four runs (two earned) in 2 2/3 innings to pick up his fifth loss of the season. Mike Olt hit his team-high ninth home run, and Ivan De Jesus Jr. blasted his third homer of the season 395 feet. Olt and Sam Travis both went 2 for 4 in defeat. 6/23 Cup of Coffee: Triston Casas and Nicholas Northcut made their professional debuts in the Gulf Coast League on Friday, though both players went hitless. Josh Ockimey hit another home run for Portland and Tyler Esplin (pictured) showed off his impressive power with a home run for Lowell. Darwinzon Hernandez and Matthew Kent each had solid outings, while Matthew Gorst made his debut in Portland. A quality start from William Cuevas and a wild Syracuse starter helped the PawSox move back to .500 on the year. Cuevas allowed three runs over his seven innings, walking two and striking out four. After a string of rough starts in May, Cuevas has bounced back and now has an ERA of 2.58 over his last 38 1/3 innings. Ryan Brasier tossed a scoreless ninth to pick up his tenth save. The offense managed seven hits, all singles, but also notched eight walks that were the difference in the game. Ivan De Jesus Jr. drew three of those and came around to score twice. Tzu-Wei Lin went 2 for 4 and drove in two runs and Rusney Castillo went 1 for 4. 6/22 Cup of Coffee: Salem and Greenville both opened the second halves of their 2018 campaigns. A 14-hit attack by the Drive, including a homer and double by Kervin Suarez (pictured), helped out Hildemaro Requena, who was on track Thursday after an off-the-rails first half. Salem dropped its weather-shortened opener despite a solid performance from Tanner Houck, while Justin Haley returned to Triple-A to lead the PawSox. 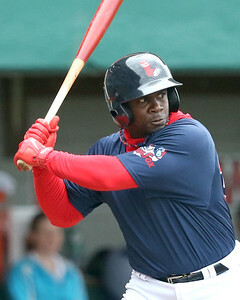 Rusney Castillo continues to be the catalyst for the PawSox, going 2 for 3 with a walk and two runs scored. It was the third consecutive multi-hit game for Castillo, who leads both the organization and International League with 87 hits. Sam Travis drove in a pair and Aneury Tavarez had a two-hit evening in support of a returning Justin Haley. Haley, returning from a stint in the major league bullpen, picked up where he left off when he was recalled. He allowed a run on four hits in five innings, lowering his Triple-A ERA to 3.06. Tyler Thornburg bounced back from a disastrous outing with a scoreless inning. Ty Buttrey continues to make his case with another scoreless appearance, his 11th straight without giving up an earned run. 6/21 Cup of Coffee: Pawtucket had a blowout win, while Portland was served a lopsided defeat in a 3-4 day for the system, as Salem and Greenville are still in the midst of their All-Star break. 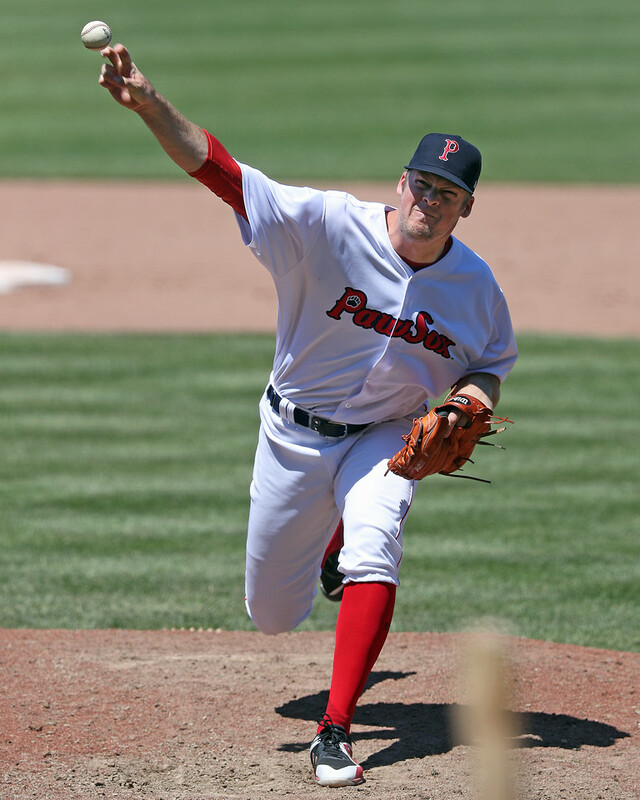 Josh D. Smith (pictured) gave Pawtucket six scoreless innings, while Tzu-Wei Lin and Adam Lind each had three hits for the PawSox. Kole Cottam roped a pair of doubles for Lowell, while the DSL Red Sox1 surrendered 11 walks in their game. Buffalo scored a pair in the ninth, but it wasn't nearly enough as Pawtucket had already gotten out to a 10-0 lead to hold on for the victory. Each of the starting nine had a base knock, with Tzu-Wei Lin and Adam Lind leading the way, as each had three hits. Anuery Tavarez drilled a solo home run, while Lind and Ramon Flores each had a pair of RBI. 6/20 Cup of Coffee: It was a full slate of action on Tuesday, with eight games scheduled, plus nine members of Salem and Greenville invited to the Carolina League and South Atlantic League All-Star games. 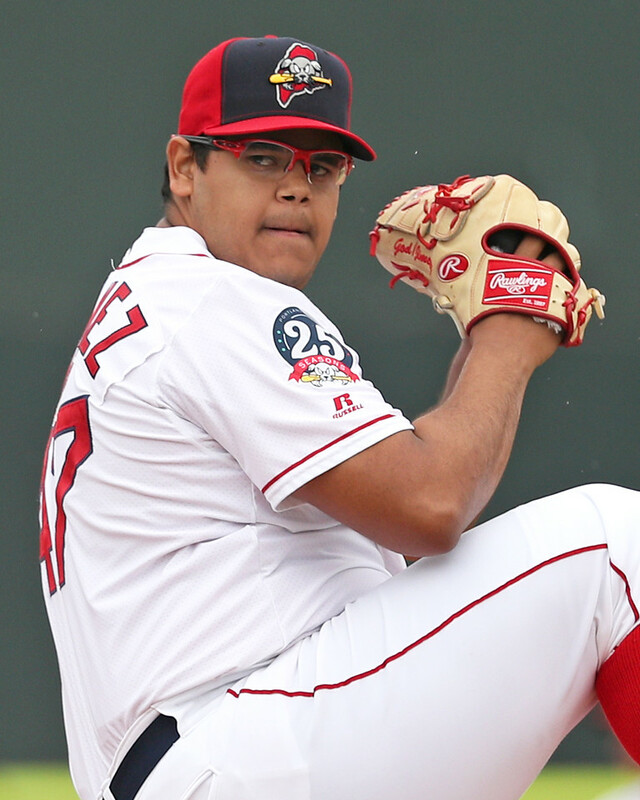 Alexander Montero (pictured) was excellent in his 2018 debut for Lowell, while the GCL Red Sox moved to 2-0. The PawSox traded shutouts in their doubleheader, while Portland was swept in its twinbill despite the efforts of Danny Mars. Jalen Beeks failed to complete five innings for the first time in a PawSox start in over two months. Beeks allowed four runs (three earned) on five hits in 4 2/3 innings, with most of the damage coming on a three-run first-inning homer by veteran first baseman Steve Pearce. Beeks struck out seven and walked four. The PawSox offense could not get anything going in the opener, getting held to a single apiece off the bats of Rusney Castillo, Adam Lind, and Ramon Flores. After getting shut out in the opener, the PawSox returned the favor in Tuesday's nightcap. Fernando Rodriguez got the first assignment in the bullpen game, giving up just one hit in 3 2/3 scoreless innings, striking out five and walking one. Williams Jerez and Ryan Brasier split the other 3 1/3 to complete the shutout. Castillo drove in a pair as he notched another two hits, expanding his league lead to 83. Tzu-Wei Lin scored three runs out of the leadoff spot and slammed his fourth homer of the season. Mike Shawaryn was having another strong start before hitting the wall in the seventh inning. Trailing only 2-1 through six innings, the righty's stat line blew up when he allowed a walk, homer, and two singles, giving him a final line of six runs allowed on seven hits in 6 1/3 innings. Danny Mars was the only player to have multiple hits in the opener, as well as the only one to record an extra-base hit. He had a double as part of the 2-for-4 contest. 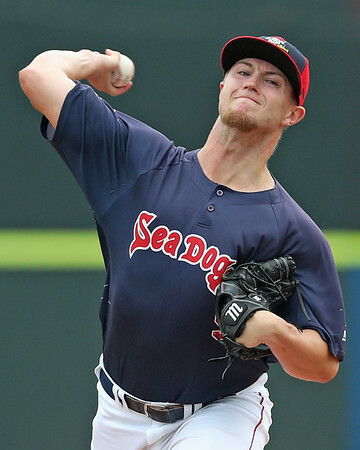 The Sea Dogs could not pull off the same magic in their nightcap bullpen game that the PawSox did, as Reading completed the sweep. Mars was again a bright spot, scoring two runs during another 2-for-4 effort, adding a triple and a stolen base. Jordan Betts drove in a pair, going 2 for 3. Five members from Salem played in the All-Star affair, with its two selected pitchers drawing the first two pitching assignments for the North squad. Daniel Gonzalez got the start, surrendering a leadoff homer to Winston-Salem Dash (CWS) outfielder Joel Booker. Matthew Gorst followed Gonzalez, surrendering a pair of hits in a scoreless second inning. Santiago Espinal got the start at DH, walking and scoring a run while going 0 for 4. Jerry Downs drew the first base assignment, going 0 for 3, while Roldani Baldwin entered the game at catcher in the seventh inning and popped out in his only plate appearance. The Greenville Drive sent four players to this year's game, as well as manager Iggy Suarez. Denyi Reyes pitched the third inning for the South squad, allowing one run. Devon Fisher, getting the All-Star nod two years removed from being converted from catcher, entered in the seventh and surrendered a two-run homer. Victor Acosta subbed in left field and went 1 for 4. Right-handed pitcher Kutter Crawford was named an All-Star but did not see action for the South. 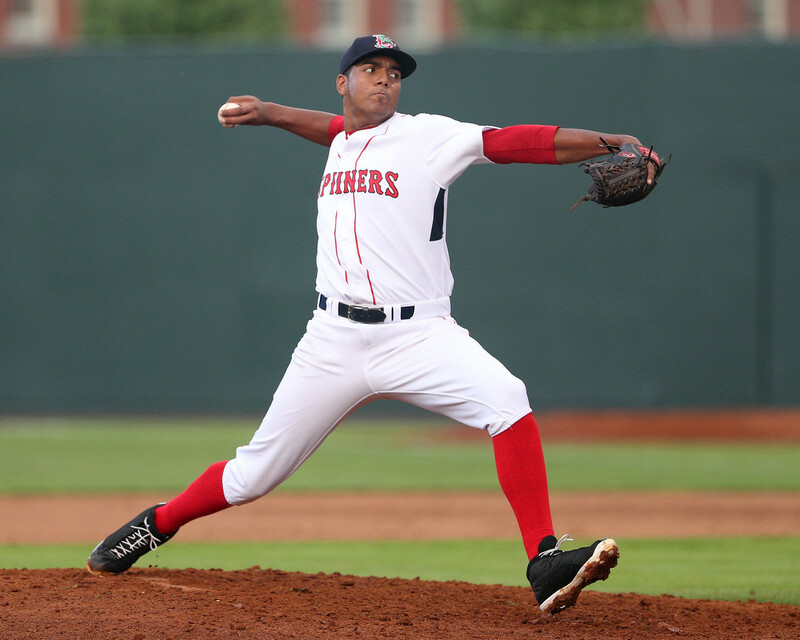 Alexander Montero got the start for Lowell and was excellent in his stateside debut. The 20-year-old righty went five innings, allowing a run on three hits and striking out seven without walking a batter. Taylor Ahearn pitched four shutout innings of relief to get credit for the win. 2018 fourth-round pick Kole Cottam drove in both Lowell runs, his first two RBI as a professional. Andre Colon had a double and triple as part of a 2-for-4 night. SoxProspects.com Director of Scouting Ian Cundall was in attendance, posting several observations on Twitter. The GCL squad moved to 2-0 on the back of some strong pitching. Yasel Santana got the starting call after working much of last season for the DSL as a reliever. Santana allowed a run on five hits in six innings, striking out four and walking one. Eddy Reynoso got the win in his pitching debut. Reynoso has been in the Red Sox organization since 2014 as a catcher, and converted to the mound this year. He went two scoreless innings, allowing one hit. From the leadoff spot, Juan Hernandez went 1 for 3 with a walk and a double, while Jecorrah Arnold and Justin Qiangba added doubles for the Sox. The Sox took advantage of the Dodgers 10 walks, but were downed by wildness of their own. Jesus Maita reached base four times, going 2 for 3 with two walks. Luis Mota added a pair of hits, and cacther Jose Navas doubled for the Sox' only extra-base knock. Nine walks helped doom the Sox staff. Starter Brayan Aquino surrendered six free passes in 2 1/3 innings, giving up two runs despite surrendering only one hit. The other Red Sox DSL affiliate's scheduled game against the other Dodgers DSL affiliate was postponed due to rain. The game will be made up on Wednesday as part of a doubleheader. Player of the Day: Rarely does a player getting swept in a doubleheader get the nod here, but Danny Mars was a catalyst for the Sea Dogs despite their overall trouble on the day. Mars was 4 for 8 with a double, triple, and stolen base. He now has an eight-game hitting streak, and a .309/.350/.491 slash line since flipping the calendar to June. 6/19 Cup of Coffee: All four teams in action on Monday got a win on the farm with Pawtucket, Portland, Salem and Greenville all with the day off. There wasn't any lack of power as the lone Sox farm team without a home run put up 20 runs. 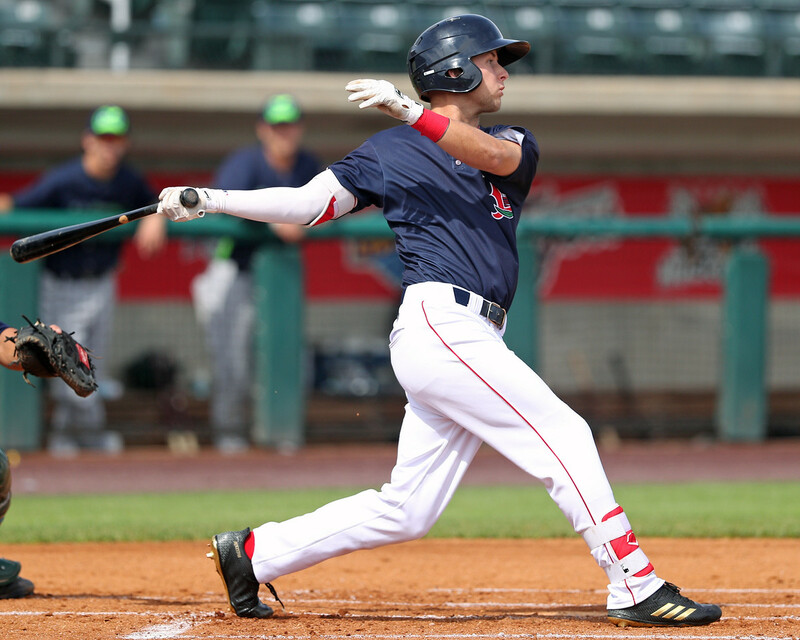 Tyler Esplin (pictured) keyed the Spinners victory with a homer, and Chad Hardy had two in the GCL Red Sox' win. A two-run double from Andre Colon scored Xavier LeGrant and Tyler Esplin in the bottom of the eighth inning and Alberto Franco shut the door in the ninth to net the Spinners their second win of the season. The key two-run hit came after Oddanier Mosqueda blew a save by giving up a run to the Yankees in the seventh. Esplin also cranked a two-run home run in the bottom of the second, which scored LeGrant. Esplin went 1 for 3 with two runs and two RBIs while LeGrant went 2 for 3 with two runs. Tyler Dearden also recorded two hits for the Spinners. Hunter Haworth pitched well over five innings, allowing four hits and two earned runs while striking out six. It was Haworth's first start for Lowell after starting four games for Greenville. The discussion of Rusney Castillo's hot spring finally made its way to the Boston media airwaves this past week, with many wondering if Castillo (pictured, right) should get called up to play in the majors. Castillo's situation is a little precarious, especially since he isn't on the 40-man roster, meaning the $10.36 million average annual value on his contract doesn't count against the collective bargaining threshold for the Red Sox. But the 30-year-old is hitting .309 this season with four home runs and 33 RBIs, and some think he could do better at the plate than Jackie Bradley Jr. Hunter Noll at BoSox Injection inserted himself into the conversation by asking the same question: Bradley or Castillo? Last Thursday, the Red Sox signed first-round draft pick Triston Casas and seven other players, and since then, have inked a total of 13 different draft picks. According to SoxProspects.com Executive Editor Chris Hatfield on Twitter, "with 13 picks signed, Red Sox have spent $4,437.200" with a little over $1.5 million remaining. Second round draft pick Nick Decker is "reportedly getting $1.25M of that, leaving $322,265" for eighth-round pick Elih Marrero, or others. Hatfield also Tweets that "Casas is going to the GCL and [Durbin] Feltman to Lowell. Decker will most certainly go to the GCL when he signs". Michelle Berth over at Over the Monster is one of many people who think Durbin Feltman could make an impact with the Red Sox right away. 6/18 Cup of Coffee: Four of the five affiliates in action on Sunday picked up victories. The highlight was the first action of several draft picks for Lowell, notably the smashing debut of seventh-round pick Jarren Duran (pictured, left). Excellent pitching was another running theme throughout the organization, as all five starters allowed one earned run or fewer, with four going at least 5 2/3 innings. 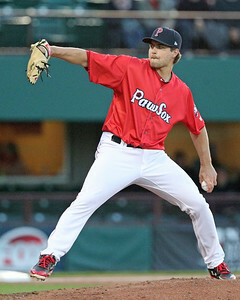 The PawSox couldn't hang on, wasting a dominant outing from Chandler Shepherd. The 25-year-old righty scattered three hits over six shutout innings, striking out five without walking a batter. He was as efficient as he was effective, needing only 76 pitches to complete those six innings, throwing 50 for strikes. Things turned quickly when Tyler Thornburg entered. Thornburg had been nearly unhittable since his rehab assignment started back up two weeks ago, but the IronPigs greeted him with a single, homer, double, and single to tack on three runs. 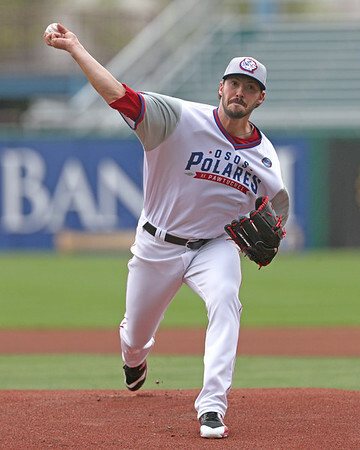 6/17 Cup of Coffee: Offensive production was lacking for Pawtucket, Salem, Greenville and Lowell, with those four teams all losing but Kyle Hart (pictured) continues to string together solid starts on the mound for Portland, his latest a 4-0 shutout of the Baysox. Antoni Flores continues to rake for DSL Red Sox2, extending his hit streak to five games with a four-hit performance as Flores' batting average now stands at .378 in 45 at-bats. William Cuevas was roughed up in four innings of work, allowing nine hits and six earned runs, as a five-run fifth inning sank Pawtucket's chances at Coca-Cola Park. Remember that episode of Spring Training scouting reports we promised? Here it is. With the benefit of time (prepare to grimace when the guys excitedly talk about how great Jay Groome looked...), it looks like Chris and Ian saw some things coming and were way off on others. 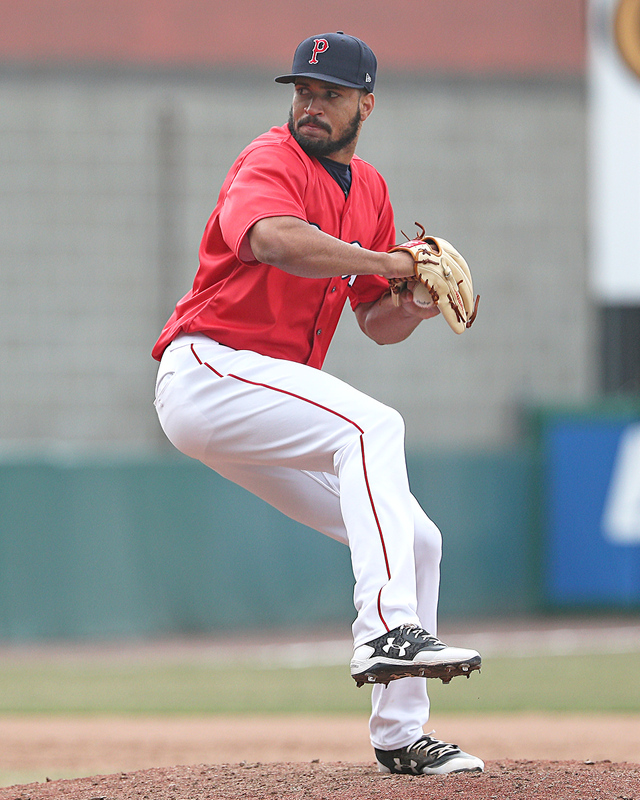 6/16 Cup of Coffee: The Spinners season started with an impressive yet inefficient start from Eduard Bazardo (pictured), while Josh D. Smith and Dedgar Jimenez turned in good starts for Pawtucket and Portland, respectively. Rusney Castillo and Josh Ockimey kept their hot streaks going with home runs and Antoni Flores hit a walk-off single in the DSL. Three pitchers combined on a three-hitter for the PawSox as they took down the IronPigs. It was the longest outing of Josh D. Smith's professional career as he fired six innings while allowing only one run on three hits. He walked two and struck out four. Williams Jerez and Ryan Brasier combined to strike out five while not allowing a hit over the final three innings. Since moving back to the PawSox on June 5, Smith has allowed only two runs over 13 1/3 innings. 6/15 Cup of Coffee: It was an eventful Thursday on the farm, highlighted by some spectacular pitching performances. Two of Boston's 2016 top draftees went head-to-head, as Mike Shawaryn (pictured, left) and ex-teammate Shaun Anderson locked horns. Tanner Houck and Joan Martinez came within one out of a no-hitter for Salem, while Greenville's Denyi Reyes continued his mastery of the South Atlantic League. 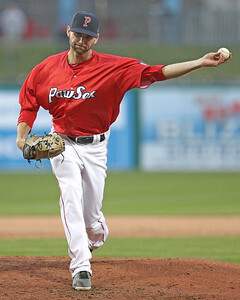 Right-hander Josh A. Smith struggled in his start, leaving the PawSox in a hole they could not dig out of despite an outstanding effort by the bullpen. The IronPigs torched Smith for seven runs (six earned) on eight hits in 1 2/3 innings. Relief pitching continues to be a strong suit, and on Thursday it was Kyle Martin, Bobby Poyner, Tyler Thornberg, and Ty Buttrey teaming up for 6 1/3 frames without giving up an earned run. Buttrey struck out three in two perfect innings, giving him a 12-inning scoreless streak over his last nine appearances. Cole Sturgeon drove in the only run as part of a 2-for-4 night. Ivan De Jesus also went 2 for 4, and is 10 for 21 over his last six contests. With the season set to start on Friday, the Lowell Spinners announced their Opening Day roster on Wednesday. The full roster is posted on our Team Rosters page, and it is highlighted by 2017 second-round pick Cole Brannen (pictured, right) who returns to Lowell after a brief stint with the Spinners to end the 2017 season. Brannen started the year in Greenville but he was sent down to Lowell after hitting .157 over 127 at-bats. 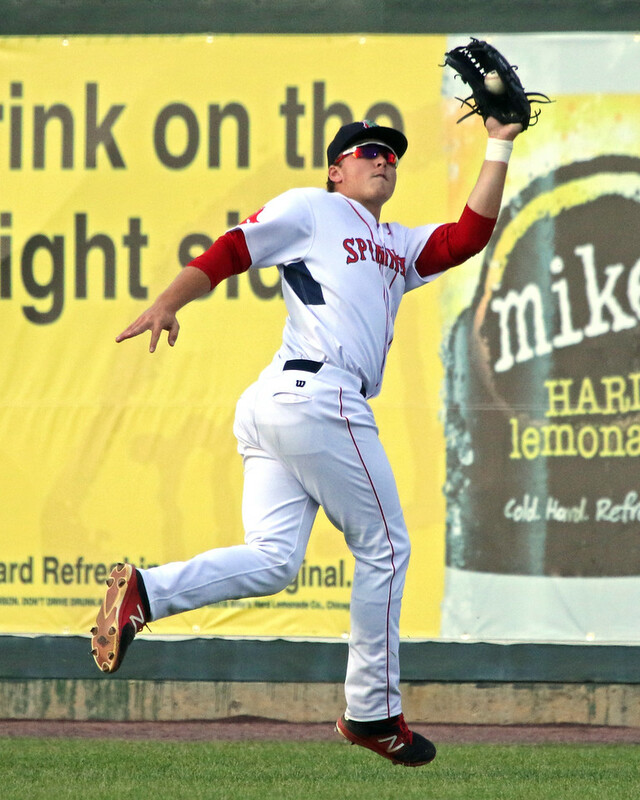 The only other players in the SoxProspects.com top-40 to join Brannen in Lowell will be Tyler Dearden and Tyler Esplin who will both be in the outfield with Brannen. Dearden was a 29th-round pick in the 2017 draft but received a slightly above-slot bonus to forego his commitment to Penn State. The New Jersey high school product has an interesting combination of power and speed that helped him succeed in the Gulf Coast League last season. Esplin was a seventh-round pick in 2017 who also received more than the slot value for his pick, and he will not turn 19 until July. 6/14 Cup of Coffee: It was an interesting day down on the farm as Portland was shut out, but the second DSL squad scored 13 runs and still lost. Pawtucket grabbed a win, while Salem and Greenville each split doubleheaders. 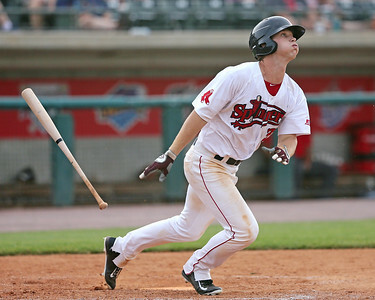 Ryan Scott (pictured) and Lewis Baez each were a home run short of the cycle, while Baez drove in four runs. Each of the starting nine for the PawSox recorded a hit as they backed up a strong performance from Jalen Beeks on the mound in his return to the minor leagues for the team's fourth consecutive win. Beeks allowed one run on six hits in seven innings of work to go along no walks and seven strikeouts. Mike Ohlman and Dan Butler had two hits each and Cole Sturgeon had a pair of RBI in the victory. After his call-up being announced on Wednesday, Jalen Beeks made his major league debut on Thursday. He had a rough first inning, allowing five runs, but settled in over his final three frames of work, surrendering just one more. The Boston Herald's Jason Mastrondato wrote about the 24-year-old's journey in advance of his outing. Beeks' replacement was Justin Haley, who is able to work in a long relief role for the Red Sox until Drew Pomeranz returns from the DL. He also has a relationship with Aaron Judge, says WEEI.com's Rob Bradford. Bradford's coworker, Cameron Kerry, discussed what is going on with Tzu-Wei Lin, who helped the Red Sox in a utility role last season when injuries were taking their toll. The MLB Draft has dominated the landscape over the last week and on Friday, Keith Law of ESPN.com delivered his recap of all 15 American League teams, including the Red Sox. Pending a physical, Boston's first-round pick, Triston Casas, is going to sign a deal for his full slot value, according to NBC Sports Boston's Evan Drellich. Kevin Thomas of the Portland Press-Herald wrote about the struggles that minor leaguers have by profiling former Sea Dog Chris Durbin, who retired at the end of Spring Training 2007. Castillo (pictured) had a rough go of it in Boston and likely will not head up to the big club for awhile due to his contract, but the 30-year-old Cuban is in the midst of his second consecutive strong season in Triple-A. He is in the midst of an eight-game hitting streak and is hitting. 400 over his last 10 games, increasing his slash line on the year to .316/.345/.436. Greenville has been struggling this season, but Diaz has been a bright spot for the Drive, despite his misleading 2-5 record. He has allowed only a .211 BAA and a 1.09 WHIP. The 21-year-old is repeating Greenville and has really improved his statistics, sitting at No. 27 in the SoxProspects rankings, up from No. 35 at the beginning of the year. 6/8 Cup of Coffee: While Jalen Beeks was preparing to make his major league debut, Chandler Shepherd (pictured) turned in another outstanding performance on Thursday afternoon. He was supported by the white-hot Rusney Castillo. Bryan Mata and Alex Scherff turned in solid-if-inefficient starts as both Salem and Greenville prevailed, while some wonky defense doomed both Portland and the DSL Red Sox1 squad. After a rough early introduction in his transition to starter, Chandler Shepherd has turned into a force in the Pawtucket rotation. The 25-year-old righty fired six shutout innings, allowing six hits and striking out four against one walk. In his last seven starts, Shepherd has gone at least five innings and allowed one or fewer earned runs five times. Ty Buttrey continues to shine out of the bullpen, striking out a pair in two scoreless innings. A trio of home runs provided the PawSox offense. Rusney Castillo and Michael Ohlman had solo shots, and Ivan DeJesus had a two-run blast. Over his last five games, Castillo is 12 for 22 with four doubles and two homers, good for an even 1.000 slugging percentage. It was an extremely busy week with the 2018 MLB Draft taking place this Monday through Wednesday. 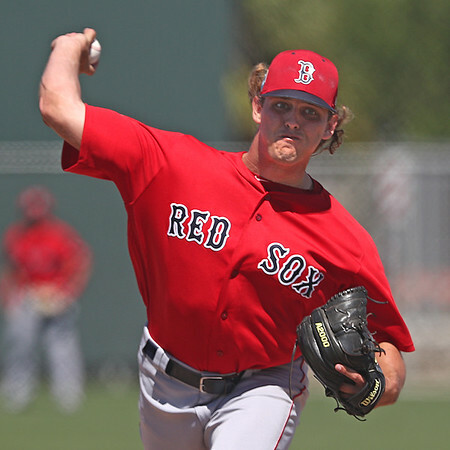 The Red Sox made 40 selections, and you can find them all on our draft page. On Day 1 of the draft, the Red Sox selected Triston Casas (pictured, left), a left-handed hitting corner infielder from American Heritage High School in Florida, and with their second-round pick took outfielder Nick Decker, out of Seneca High School in New Jersey. SoxProspects.com Executive Editor Chris Hatfield and Director of Scouting Ian Cundall stayed up after the draft to record a podcast with their initial thoughts on the Red Sox first two picks, Casas and Decker. The Red Sox elected to select two high schoolers with their first two draft picks, something vice president of amateur scouting Mike Rikard said he'd do before the draft if they represented the best players available. Mike Richardson of MLB.com takes a look at what Rikard and Co. saw in their top-two picks while also noting how the Red Sox targeted collegiate arms on Day 2. In the 2018 MLB draft, eight former Red Sox draft picks were selected. This total is down from 12 in 2017. 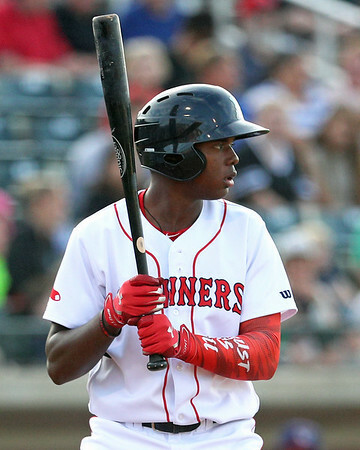 Over the past two years Boston had seen five of its former draftees come off the board in the first two rounds, but that trend changed in 2018, as DJ Artis remained on the board until the Chicago Cubs nabbed him in the seventh round. Interestingly, the Washington Nationals used consecutive picks on players the Red Sox had taken in 2017: pitchers Carson Teel and Ridge Chapman. 6/7 Cup of Coffee: All four of the full-season affiliates took victories on Wednesday night, while DSL Red Sox1 was the only team to put one in the right-hand column. Jhonathan Diaz (pictured, left) pitched seven shutout innings for Greenville in the system's best pitching performance, while Santiago Espinal (pictured, right) led the system in hits with three. Williams Jerez, Robby Scott and Ryan Brasier combined for 3 2/3 two-hit, shutout innings to finish off a strong offensive performance from the PawSox, who saw four multi-hit performances. Dan Butler hit a three-run home run in the second inning and Anuery Tavarez added a solo shot in the third. Each had three RBI on the night. William Cuevas allowed one run on three hits in 5 1/3 innings, with three walks and four strikeouts. Of the 40 Red Sox 2018 draft selections, 15 were ranked in the Baseball America Top 500, 17 in the Perfect Game Top 500, and 5 in the MLB.com Top 200 list. 19 Red Sox selections appeared in at least one of the lists, up from 12 in 2017. See below for a listing of the 2018 Red Sox draftees who were ranked by BA, PG, or MLB.com. The full list of this year's draft selections can be found over at the SoxProspects.com Draft History page. Welcome to the Draft Signing Period! Now that the 2018 First-Year Player Draft is in the books, the signing period is upon us. This year's signing deadline is 5:00 pm ET on July 6, 2018. As most of our readers know, each team's spending on draft pick bonuses is capped. The bonus cap is determined by the number and placement of each team's selections. The bonus cap sets an aggregate limit for a team to spend on its selections in the first ten rounds, and also limits teams from spending over $125,000 on players taken after the 10th round (the excess on any late-round bonuses will count against the bonus pool). Boston's cap is $5,699,000 this year. If the club exceeds its pool: (1) by 0-5%, it will be charged a 75% tax on the excess; (2) by 5-10%, it will pay the same tax and will also lose its first-round pick next season; (3) by 10-15%, it will be charged a 100% tax on the excess and lose its first- and second-round picks next season; and (4) by more than 15%, 100% tax on the excess and lose its next two first-round picks. Following Tuesday night’s win, Red Sox manager Alex Cora announced that left-hander Jalen Beeks, the number five prospect in the most recent SoxProspects rankings, will make his major league debut Thursday against the Detroit Tigers. After being selected in the 12th round of the 2014 draft out of the University of Arkansas, Beeks has made a steady rise through the system, putting together solid performances at every level while tweaking his mechanics and arsenal along the way. This year, Beeks has been especially dominant in Triple-A Pawtucket, striking out 35.4% of hitters while cutting his walk rate down to 6.2%. Last year, he had set a career-high strikeout rate of 28.7% in Double-A Portland before earning a midseason promotion to Pawtucket, where he struck out 24.1% of hitters. During that time with the PawSox, he had what had been his lowest walk rate since 2016 at 8.2%. Beeks is undersized for a starting pitcher, part of the reason why many people suspected he would end up in the bullpen long-term, an outcome that is still a possibility, although less so than coming into the year. He has a strong lower half and has filled out his 5-foot-11, 195-pound frame with no remaining projection. 6/6 Cup of Coffee: While most eyes were focused on Day 2 of the amateur draft, there was a full slate of games on the schedule Tuesday. Kutter Crawford (pictured, right) and Enmanuel De Jesus both were excellent as the starters in the Greenville doubleheader, as the Drive split, failing once again to give Crawford any semblance of offensive support. Pawtucket managed to turn a 17-hit, 23-total base effort into only four runs, despite a big effort from Rusney Castillo. Despite a 17-hit attack, Pawtucket could not come through in the clutch and posted only four runs. Rusney Castillo was 5 for 5, and his pair of doubles gives him a franchise-leading 18. After starting his PawSox career 0 for 8, Adam Lind blasted a two-run homer in the sixth inning. Lind, starting at first base, added a double and single. Lefty Josh Smith got the spot start, giving up just one hit in three scoreless innings. Tyler Thornburg re-started his rehab, striking out one in a perfect seventh. 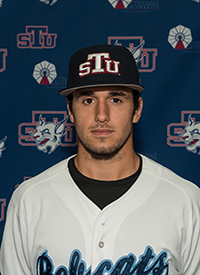 With their eighth-round pick (250th overall) the Red Sox selected Elih Marrero, a catcher out of St. Thomas University (Fla.). His father is former Major Leaguer Eli Marrero, and he is cousins with former Red Sox first-round pick Deven Marrero and former PawSox first baseman/outfielder Chris Marrero. The Miami native was previously selected by the Reds in the 29th round of the 2015 draft out of Coral Gables High School after being named a Perfect Game USA Second Team All-American and being ranked 124th on Baseball America's list of top draft prospects. He then committed to play at Mississippi State University. While he was the team's starting catcher his freshman year, he hit only .233 over 150 at-bats. In his sophomore season, he played only four games before missing the rest of the season due to off-field issues. 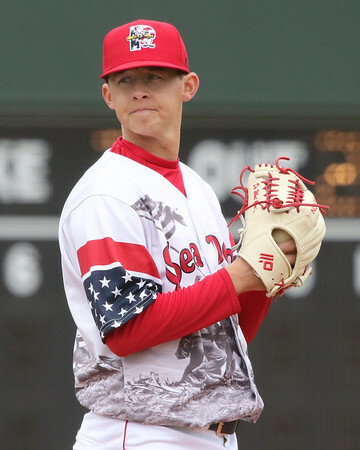 In the seventh round of 2018 MLB Draft, the Red Sox selected Jarren Duran from California State University, Long Beach. Listed at 6-foot-2, 200 pounds, the junior was a three-year starter at second base for the Dirtbags where he accumulated 49 stolen bases. Ranked as 170th best prospect in the draft by Baseball America and the 317th by Perfect Game USA, his selection at pick 220 overall seems in line with the expectations for those publications. Interestingly, Duran was announced as a center fielder. With their sixth-round pick (190th overall) in the 2018 MLB First-Year Player Draft, the Red Sox selected Devlin Granberg, an outfielder from Dallas Baptist University in Texas. Granberg, a 6-foot-2 senior, was highly thought of for a senior sign, ranked 245th on Baseball America's list and no. 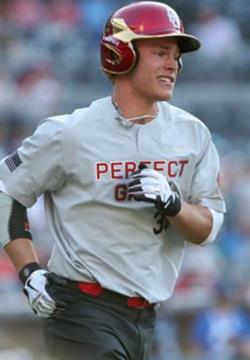 408 by Perfect Game USA. Granberg has been productive at the plate throughout his collegiate career, hitting .427/.508/.680 with 25 home runs in 163 games between Creighton, Cisco Junior College, and Dallas Baptist, but he has never been drafted. He has good hand-eye coordination at the plate and generates good exit velocity with above-average bat speed. He can also run for a player of his size, stealing 23 bases in 2018, but despite that, he is still limited to left field due to fringe-average defense and a below-average arm. 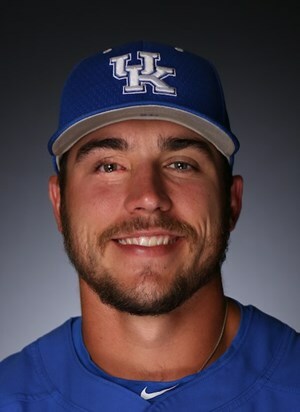 With their fourth-round pick (130th overall) in the 2018 MLB First-Year Player Draft, the Red Sox have selected Kole Cottam, a catcher from the University of Kentucky. Cottam is ranked 361st by Baseball America and 322nd by Perfect Game. He was not ranked by either MLB.com or Keith Law of ESPN. The 21-year-old had a monster 2018 season for the Wildcats, blasting 19 home runs on his way to a .352/.438/.667 slash line, splitting time between catcher and first base. As a power-hitting catcher, Cottam exhibits quiet mechanics and an ability to loft the ball in the air with authority. He does have some swing-and-miss in his game, with 51 strikeouts this year in 260 plate appearances. With their third-round pick (100th overall) the Red Sox selected Durbin Feltman, a right-handed pitcher out of TCU. Feltman is ranked 70th by MLB.com, 94th by Baseball America, 84th by Perfect Game USA, and unranked by ESPN's Keith Law. Feltman serves as the closer for the Horned Frogs where he set a school record and was second in the nation with 17 saves during his sophomore season in 2017, finishing with a 3.64 ERA, 1.28 WHIP, and 37 strikeouts to 15 walks over 29 2/3 innings. This year, he started out the season with 13 straight scoreless appearances and ended up allowing only two earned runs all season for a 0.74 ERA matched by a 0.74 WHIP to go along with an impressive 43-6 strikeout-to-walk ratio.